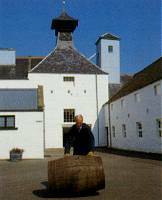 Dallas Dhu Distillery is a perfectly preserved time capsule of the distiller's art. It was built in 1898 to supply malt whisky for Wright and Greig's "Roderick Dhu" blend. See and hear how whisky was made, and sample a free dram. There is an audio-visual presentation in the distillery. About one mile south of Forres off the A940.